We want to preface this that we respect Toms3D and what he does. This is just something that comes up over and over regarding our kits and our data across over 4000 sensors contradicts the information that Toms3D put out. Quite frequently we get people quoting this test from over a year ago that Toms3D made. He got a multitude of different sensors but only a sample size of 1 sensor per variation. This post aims to point out the issues with the test and why this test shouldn’t hold any weight not just for our kits but even others on the market. The sample sizes were with 1 probe per solution. The testing does not take into account properly calibrating any of the probes that have calibration. Also The BL-Touch Test was ran with the sensor on its SIDE! This probe needs to be mounted vertical. Regarding capacitive sensors there are MANY different off the shelf variations and this is not even mentioned at all. Myth #1 Foil Tape “Works” – In addition to the above article issues the one thing we see a lot of newbies doing is putting foil tape under their bed so that they can use cheap inductive sensors on glass beds. This is not the correct way to do it as you are then getting your readings from the BOTTOM of the surface you are printing on. This means that if the glass is not flat you will not be compensating correctly for the issues the glass has on the surface you are printing on. We use capacitive because they work on all surface types that we print on and actually detect the glass surface. This foil myth is commonly told by the same guy that claimed he invented the Prusa PINDA probe and that Prusa “stole” his idea. Don’t level the bottom of your bed. Use the correct solution for the job. Myth #2 You don’t need an opto – There are many ways to connect your sensor to your board. We’ve seen voltage dividers with resistors, transistor setups, diode setups, and opto IC setups. The opto IC is the safest way to connect your higher voltage probe to your 3.3V or 5V input on your printer board. There is 0 chance for that higher voltage to enter the printer board even if a component fails. We’ve had people put 120-220VAC into our boards on accident and their printer boards were 100% unharmed because we have everything properly isolated. People don’t go with the opto IC method because they are cutting costs and it is more complex to setup than the other mentioned methods. We want to have 0 chance of frying a customer board even when they install it incorrectly and that is why we choose the best method – opto IC isolation. Opto IC isolation is the safest method. It’s also the most expensive but printer boards aren’t cheap either. From a technical standpoint TH3D’s V3 kits are using a custom capacitive sensor type for the 12mm (EZABL Mini) and 18mm (EZABL) sensors. When we first started out we were using off the shelf orange tip sensors and then moved to custom colors on them for the V1 kits. Since January 2018 when the V2 kits were out we switched over to a completely custom sensor that we worked with our sensor factory to produce for TH3D. The customization is not only just for the appearance of the sensor (blue tip/black wire) but also the internals. As we collected customer returns and DOA sensors we sent them back to the factory for analysis. They determined that the failure of the ones we sent in were due to a lower quality IC ship inside the sensor that was failing. At an increased cost and the stipulation of a minimum order quantity our factory that we work with agreed to source “imported” (aka not Chinese) IC chips to use in the sensors to decrease failure rate, increase reliability, and increase accuracy. Our probes operate at a 100hz frequency and most off the shelf capacitive types work at 60-80hz, while the off the shelf ones can get the job done we wanted to make sure we are using the best we can. While we trust our factory that makes the sensors we always verify. We’ve literally cut open and through the epoxy in the different sensors we’ve used and there are physical differences between the V1, V2, and our latest V3 sensors. They are making the changes that they said they were. We currently have a failure rate UNDER 1% on our kits and that includes kits that were sent back that then tested fine on our machines here. We also employ power filtering on our EZABL board to combat issues with poor quality power suppliers on these Chinese machines so that very little PSU noise makes it to the sensors, this increases accuracy and reliability. Issue #1 – The sample sizes of the probes was literally one probe, we’ve tested over 4000 sensors here to date, what scientific test uses a sample size of 1? This is not a good measurement as there can be variations in quality and accuracy from each different manufacturer. We can tell you that when we were testing different variations from different companies we can have to identical probes that work completely different. This is why we stick with the same factory and pay more for better internals plus extra QC at the factory level because they are able to provide us with very consistent sensors in the same batch and even across different batches. We track all failures and if there is a pattern emerging we always look into it further to address any issues. Issue #2 – The probes we use need to be calibrated when on the machine and if not calibrated they will NOT work correctly and/or be accurate. There are ideal ranges that each sensor must be set to for the best performance and this is not even mentioned or covered in his video. For all we know is that they were never calibrated and can be completely out of spec when they were tested. In addition to calibration the probing speed, too fast or too slow, can completely change the accuracy of a probe. The settings in our firmware are based on actual testing that was done for over a YEAR to find the best speeds to use. We found 4mm/s and 8mm/s to be the best for the kits we sell. Issue #3 – TH3D is a home based business. We have no specific climate control in our office. We have a supplementary AC unit in the office that runs when we are in here and the room goes from 72F during the day to 84F overnight when all the machines are running. Our humidity swings from 40% up to 65% in here as well in addition to temperature. Capacitive probes are affected by temperature but in our testing and on our own machines we do not see these large “0.2mm” deviations that he is talking about, 9/10 there is no adjustment needed at the start of a print and if there is we have the Babystepping feature (this is usually under 0.1mm) in the firmware. This is why we recommend pre-heating the machine to combat any slight possibility of a swing in trigger distance when using our kits. Sometimes we don’t remember to pre-heat the bed and this does not have an effect on our machines. But like Tom said he said that it could be the machine itself changing with the heat and not necessary the probe itself. We have many different sensor versions on our machines since older machines have older kits on them and newer machines have newer kits on them. All of them work consistently. TLDR; pre-heat the machine to combat any potential issues with sensor drift or physical machine changes due to heat. Issue #4 – Just talking about off the shelf sensors there are dozens of variations of the probes from NPN NO, NPN NC, PNP NO, and PNP NC configurations to completely different models. This is not even taking into account that you can get different “grades” of sensors from suppliers overseas. We have options to get Grades from A to C with C being the lowest quality. We only use “Grade A” sensors. This means they are assembled with more care, have minimal to zero cosmetic issues, and better components inside them. 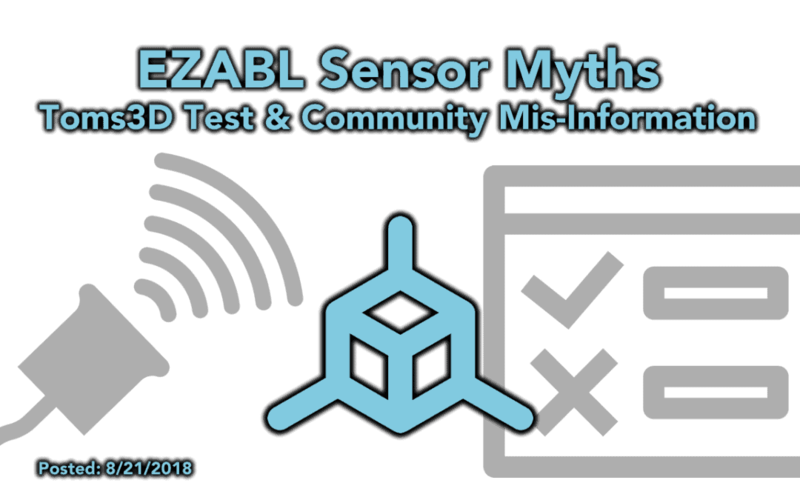 We hope this article helps inform you about the issues with this testing video and why we feel is it not accurate at least in regards to the EZABL kits we produce here as well as other myths that get spread. We cannot speak to other kits/parts on the market. Tim has used random sensors before TH3D was a company sourced from eBay, Amazon, and AliExpress along with friends of ours and found that the quality and consistency is all over the place. You are basically getting the luck of the draw and have no idea what kind of quality sensor you are actually getting. We could cut our costs on the kits considerably by using cheaper parts on our boards and sensors but we choose not to because the quality and reliability of our products matter greatly to us. Thanks for reading and Happy Printing!